The right tool for searing, sauteing, simmering, braising, baking roasting, frying. From the kitchen to the campsite the Square Dutch Oven is perfect for roasts, casseroles, ribs, breads, and much more. The eight quart capacity is large enough for all your cooking needs. The legless design makes it perfect for use in your home kitchen. This cast iron piece gives cooking superiority by evenly distributing heat to cook your food to perfection. Checking temperatures is easy with the thermometer notch allowing you to insert a probe without lifting the lid. To expand versatility the lid has been designed with raised ribs so it can double as a grill on your stove. Our new 13 inch Square Dutch Oven has gained some respect. It has been featured in Petersen's Hunting Magazine as one of their Torture Tested Products in a recent gear magazine. Dutch oven cooking allows you to prepare the heartiest meals that are only achieved with cast iron cookware. Use this 8-quart, 14-inch Dutch oven for your family favorite recipes. This cast iron piece has a flange on the lid making it excellent for cooking with charcoal briquettes or wood. Best of all, each piece of our cast iron cookware comes pre-seasoned with our True Seasoned Finish, providing a natural, easy-release surface that is ready to cook on. Add this oven to your Dutch oven collection today. Great for use at the campsite or in the kitchen! King Kooker 4 quart cast iron dutch oven and lid. Cast iron construction allows for even heat distribution, eliminating cold spots. Wonderful for soups, stews, chili, jambalaya and gumbo! Excellent for roasting and frying! Pre-seasoned and ready to cook! 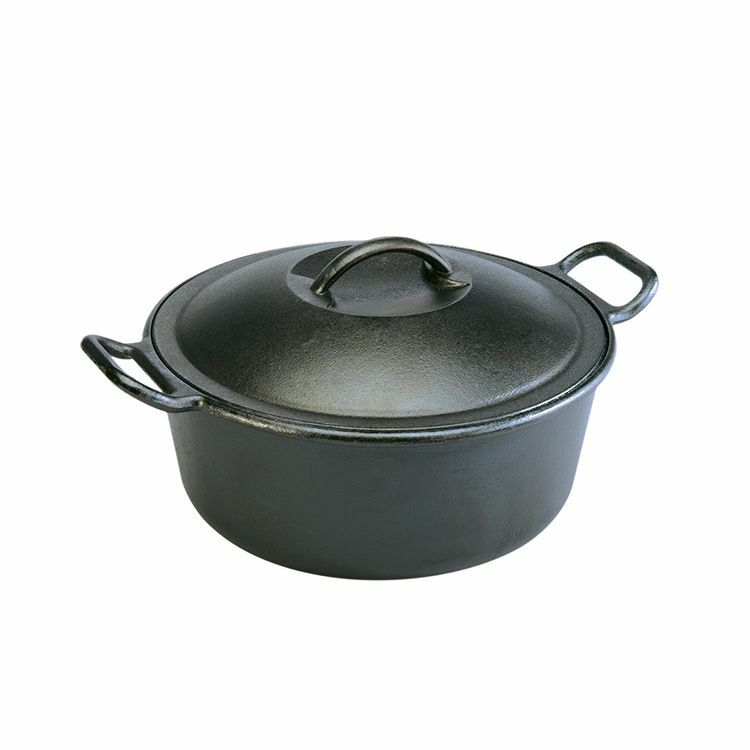 4-Quart Dutch Oven Since 1896, the Lodge family has been casting premium iron cookware at our Tennessee foundry. As the sole American manufacturer of cast iron cookware, we are proud to carry on the legacy started by our great grandfather Joseph Lodge. We don`t just make products; we make heirlooms that bring people together for generations. At home in the backyard, the backwoods, or the ballgame. Brutally tough for decades of cooking.